You are invited to participate in the exceptional fine dining experience at the historic Morrisons Rogue River Lodge. 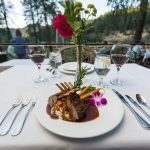 Here you’re likely to enjoy one of the best meals you’ve ever experienced, an all-inclusive four-course dinner from Morrisons prix fixe menu as you overlook the beautiful Rogue River. 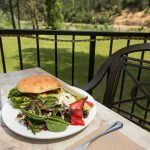 Weather and temperature permitting, Morrisons Rogue River Lodge offers the wonderful experience of dinner out on the deck, overlooking a breathtaking view of the Rogue River. Enjoy our manicured grounds as the lawn stretches out before you down to the river’s edge. You are seated at individual tables according to your party size. In the event of a rainy or cool night, you are served in the dining room or meeting room so you can still enjoy the view through the picture windows. You have a choice between two entrees each evening, and the menu changes nightly. 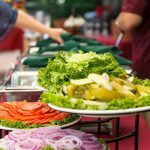 The chefs in Morrisons legendary kitchen prepare your meal using the freshest and best of local ingredients, including our produce, which our master gardener tends to at our state of the art fruit, vegetable, and herb farm here on the property. Morrisons offers an excellent wine list and a full-service bar. We feature some of the finest Southern Oregon wines available and a handful of exceptional varietals from the Pacific Northwest and California. You are invited to arrive early for dinner and enjoy a cocktail or a glass of wine along with the view. 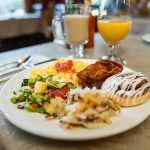 Full country-style breakfast from 7 am to 9:30 am for all of our lodging guests. With prior notice, guests that are departing on a rafting or fishing trip from our location are welcome to join us. Lunch begins at 11:30 am. Please call for availability & join us for our BBQ under the trees. Adult Beverages are available at the bar inside the lodge. Prices are reflected in bar menu. We begin with a lovely starter course, followed by Morrisons renowned freshly baked orange dinner rolls, and then a fresh garden salad. Your choice of entrée is served with fresh vegetables and a potato, pasta, or rice dish. Gluten-free pasta and bread are available upon request. Reservations are required with your entrée choice selected before arrival. Day of reservations will be taken until 3:00 pm. Non-lodging dinner guests are welcome to join us for dinner. During the fall season, there may be some evenings that dinner is not available. Please call for availability and reservations. 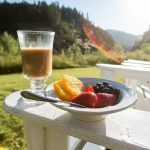 Lodge guests should note that dinners are not included with accommodations, although some or all meals, including full country breakfasts and box lunches, might be part of a rafting, fishing, or other packages. 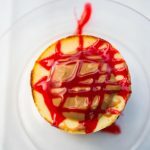 Regular Kid’s Meals will also be offered. 7 PM seating, $40 Per Person.